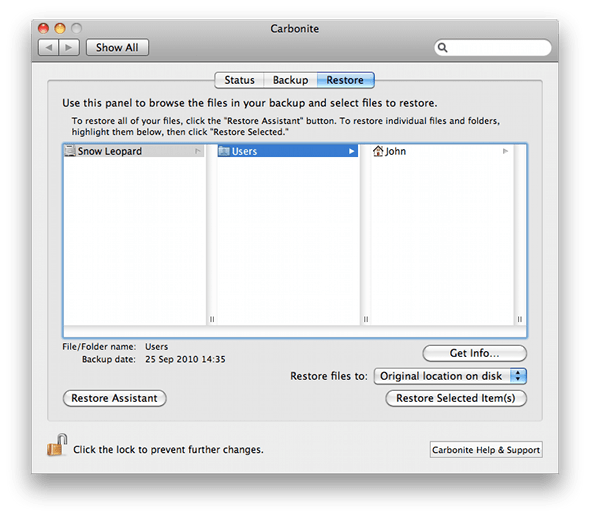 Carbonite, an online backup tool for both Windows and Mac OS X that has been around for a while now, in fact, we reviewed Carbonite on Zath this time last year, however, it’s recently gotten a major version update to 4.0, with new features for you to sink your teeth in to! So what’s been added since the last time we saw Carbonite? There are three main features which have been added to version 4.0: the restore manager; a new custom setup option and a redesigned info centre too. The restore manager of Carbonite 4 now allows you to restore files from your online backup with ease – after all, the only reason you back up all of your data in the first place is because at some point you may have to get it back – and you can now easily specify whether you would like to restore an entire hard drive, a certain folder, or maybe just a file that you’ve backed up. The interface of the restore manager makes this really easy, with your folders and files displayed in a columnar fashion. This allows you to see at a glance all of the folders that you have backed up, but also where they came from on your drive. For example, if I wanted to restore a file from my documents folder, I would go to my restoration data, and select “Snow Leopard”, “Users”, “John” and “Documents” before selecting the file from the folder itself. This also makes it really easy to put a file back where it originally was as well, so you know where it belongs straight from the backup file. Simple! The new custom setup option in Carbonite 4 allows you to not only customise what is backed up but also set a backup schedule and manage your own encryption key for your backups. In addition to the brand new custom setup, there is a completely re-designed information centre, which now focuses on primary backup and restore tasks for the user. You will also find a migration wizard which will allow users of Carbonite on Windows to restore all of their files. This is made as simple as possible as Carbonite remembers your file structure from the initial backup so that all of the files are restored into the right folders. Next, to versioning, which allows you to keep track of various versions of the same files, Carbonite may just be the perfect backup tool that you’ve always needed.